When Singapore Airlines ran a 50% off flight redemption promotion last year, we all thought it was crazy. Still with that being said, it was Singapore's Golden Jubilee year last year and the whole SG50 pride was in full swing. I managed to chance upon the following promotion this evening as I was browsing the internet - 30% off Online Flight Redemptions on Singapore Airlines! 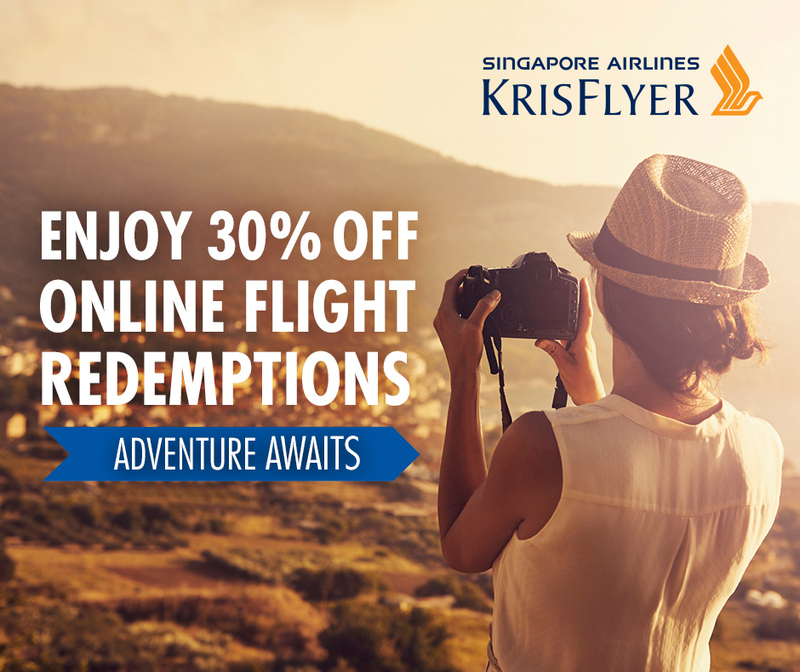 Click HERE to save 30% of your KrisFlyer Miles now! Before you get super excited, travel needs to happen between 15 February 2016 to 26 May 2016 and reservation has to be made between now and 14 February 2016. See below for a snapshot of prices (in required KrisFlyer Miles) but definitely check out the main site for more information! KrisPay, a digital wallet launched July last year by Singapore Airlines will now allow you to convert your KrisPay Miles into KrisFlyer Miles within 7 days of accrual at participating KrisPay partner outlets islandwide. You may remember that KrisPay used to only allow members to convert their precious KrisFlyer miles into KrisPay miles at a ridiculous rate. Fast Track to KrisFlyer Elite Gold with American Express Singapore Airlines KrisFlyer Ascend Credit Card - Spend S$12,000 (Only S$3,000 on SQ) in 3 Months! In collaboration with Singapore Airlines, American Express will be offering a limited-time promotion for all existing and new cardholders of the Singapore Airlines KrisFlyer Ascend Credit Card to obtain KrisFlyer Elite Gold membership tier by spending S$12,000 (out of which, only S$3,000 must be spent at SingaporeAir.com or on the SingaporeAir mobile app) between 01 March 2019 to 01 June 2019.